Second from the left is the Heiliger Vizhnitzer Rebbe, The Ahavas Yisroel zt"l. The Rebbe in the middle is Reb Alter Dzikover HY"D, his son-in-law. Next to him is the "Damesek Eliezer," Reb Lazer'el Vizhnitzer who died in Tel Aviv, childless, in 1946. Reb Lazer'l was the one went back to Vizhnitz after WWI, when his father had moved to Nagyvarad/Grosswardein/Orodea during WWI and never returned to Vizhnitz. They say it was because he couldn't bear to see how so many of his Chassidim had removed their beards and worse. When he was asked why it was better in Grosswardein, an Oberlandishe city where men shaved their beards as well, he answered: Zeyere Tattes Hub Ich Nisht Gekent.... Reb Lazer had a large Yeshivah with a dormitory and food served, an unknown commodity in other yeshivos in Europe. They also say that the Ahavas Yisroel moved away from Bukovina so as to save his own family from the winds of the day, the array of movements that were so popular among the youth of that period. Which again brings to mind the "Ani Es Nafshi Hitzalti" approach we discussed recently. I was once talking to a Vizhnitzer/Kosover Yid, and the discussion got to Vizhnitz, and whether or not they too were part of the "save your yourself first, and worry about others later" brigade. I was under the impression that the Vizhnitzers were not part of them, that they had genuine love for every Yid, and that they wouldn't abandon their own to the elements like that. This Vizhniter Yid held Davka Farkert. "Yes, he loved every פויער that came to him, and would even kiss him on his forehead like a father to his son. But when it came to saving his own there was no compromising for the sake of others." In other words, once he saw that his own children were at stake he upped and left and never looked back. Some here would say that it's nothing more than abandonment of people that believed and trusted in you, and they say the same thing - even more so - when it comes to Rebbes leaving Poland/Hungary during the Holocaust. We tend to forget about those people, the huddled masses that were so loyal to Rebbes because today's different, everybody a gavra far zich. Then again, were it not for the Vizhnitzer Rebbe leaving Bukovina there might have not been a Vizhnitz today, and were it not for the Belzer Rov zt"l leaving Budapest in 5704 there would probably not be a Belz today. That may not sound all that important to you, but it was to the Rebbes, and to what they saw as their mission in life - building for the future. That's the underlying theme when it comes to Belz; the Rov gave that as his reason for leaving even as the Jews there begged him to stay and be the Tzaddik who's Maygen on them. So too with Vizhnitz; in Marmures the Rebbe had simple, frum people who never were fodder for Haskoloh etc., and that's where he could build for the future, even at the expense of the Bukoviner Yidden. The Picture is thanks to ASJ. 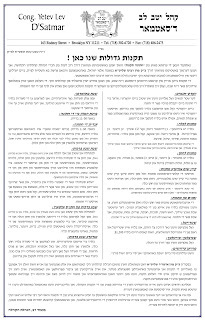 I clipped the ad from Der Blatt of this week. I guess the Aronim are a depressed bunch. The call for ideas bore fruit; there were many ideas, and we'll choose one, the Ger/Lubavitch relationship, both past and present. Where do we start? and where do we draw the line? Do we include political motives as sincere solidarity, or just something that was worthwhile politically? Are we mechalek between Rebbe and Chassidim, or does the Rebbe set the complete tone, no matter what the Chassidim think and do? There also the issue and worry of alienating Gerrer Chassidim who read this blog - you know who you are - something I don't want to do. So I'll tread lightly, and hope to Hashem that there will be no fallout from this post. I also would like to preface that by saying that by no means will I allow this to become an all-out "Ger-Bashing" by those angry at Ger for whatever reason, imagined or real. I also would ask for your understanding when criticizing the post for missing facts and/or episodes, since I'm doing this from memory, and memories - as you may know - are quite flawed. 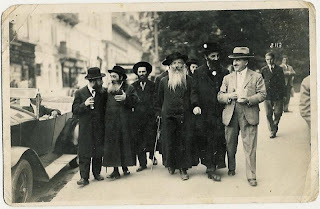 The first connection that I know of between Ger - the forerunner of Ger rather - and Lubavitch was after the passing of the Kotzker Rebbe zt"l, when the Chossid Reb Moshe Meshel Gelbstein (who later moved to the Holy Land) who had been a Kotzker Chossid began to look for a new Rebbe, since his Rebbe had passed away. (Ger is an offshoot of Kotzk) Until then I don't think there was a connection, unless maybe we count any connection to Pershischah as relevant. Reb Moshe Meshel was not a Rebbe, so maybe that doesn't count either. 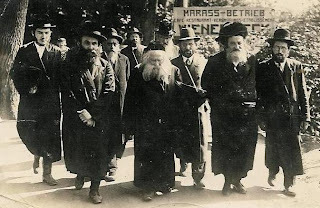 Fast forward to the Rebbe Rashab and his opposition to the Agudath Israel in Poland, a tradition carried on by his son the Rebbe Rayatz of Lubavitch. 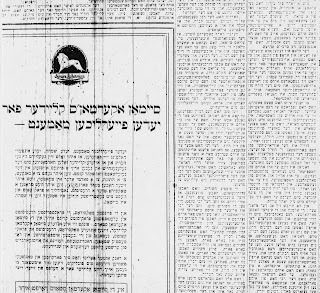 The letters to the Imrei Emes about why they so vehemently opposed the Agudah were so "sharp" that they needed to be removed from the letters of the Rabbeyim that were published. 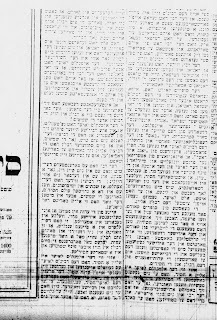 Most of those letters were printed by Kanoyim to show how strong the opposition to the Agudah was before WWII. Seforim like Tikkun Olam are full of them. 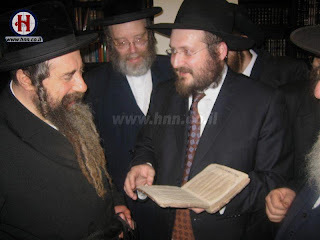 There was also the fact that the Imrei Emes endorsed the learning of Mishneh Berureh over the Alter Rebbe's Shulchan Aruch - which was the accepted Halochoh Sefer in Poland until that time - which irked Chassidim and Rebbes alike. That, and the doing away of Chassidic practices by the Imrei Emes, like davening after Zman Tefilloh too. Off hand I don't remember what (if at all) the connection was between the FR and the IE while the former was living in Poland. I know Ger didn't like other groups that were considered proselytizers, especially the Breslovers. Yidden like Reb BZ Apter and other Chashuvei Breslov were marked men as far as Ger was concerned, but that didn't necessarily extend to Lubavitch too. After WWII, things were different. Most people forgot about the differences they had with other groups, at least for a little while, and decided to work together for the common good of the Jewish Nation. There were those that were not Mevater on their old differences even then, but we'll avoid that subject for now. After the establishment of the State Of Israel the need to work together was even greater. While Ger was at the forefront again of the Agudah, Lubavitch chose to stay out of it, just as they had done in Russia and Poland, which, again, is to be understood. This, according to some, is one of the big "Taynes" (KeVayochol) against Lubavitch; why didn't they join the Shtadlonim of the Agudah when they were so needed? Why didn't they join the Agudah's Chinuch Atzmoi Chinuch system when their help and input could've helped so much in the early days of the State. Ironically, many of those with the "Taynes" are not Agudists themselves, but that's beside the point. I'll go out on a limb here and say that The Beis Yisroel of Ger was probably not very happy with the stand Lubavitch took vis-a-vis the Agudah and its institutions, even if the Kfar Chabad magazine keeps on reminding us via the story with Reb Yossel Segal how he had great Koved for the Rebbe, which is also true. Now Shlomy Gertner wants some of the limelight, so he puts out his own little Tzetzel. I've backed off and will not take part in the upcoming event. What gets me is how they all see themselves as "servants" of Klal Yisroel, as if they're Marbitzei Torah or Kiruv Workers. There's also the message that "I'll be back," and that he's not giving up his singing any time soon. Then, we can talk about the whole him being in love with himself issue, as the Possuk he chooses shows. Writers Block + No Time = No New Posts. Maybe we can talk about this. Let's get off the Lipa Topic and back to the what made us great, at least part of it, bringing you the best in historical documents and photographs. 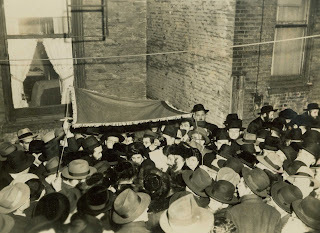 Here's the Bobover Rebbe's wedding in New York in 1946/1947. He had lost his first wife and some children during WWII, and had smuggled himself across the border to Hungary where he survived the war. 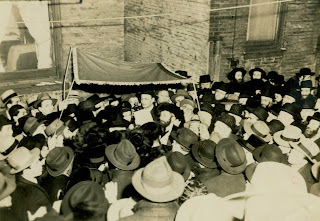 After the war, IIRC with the help of his sister and BIL in Milwaukee, he set sail for New York and soon was to be married to the sister of the Tomashower and Czechenower Rebbe LeBeis Rubin in New York. They too were Sheyne MeYuchosim, Sanzer Eyniklech through the Babbe Chume'le, daughter of the Sanzer Rov. Let's forget the Kol Kore, it's beside the point, what we may have March 9th at MSG is a showdown, a duel that's been in the making for quite some time now. There are hundreds and thousands of alienated youth and not so youth who feel like they've been given the shaft all these years. They may have hard times in Yeshivos, or maybe they were asked to leave Yeshivos altogether. Many of them never left the fold, and many may still love Torah and Yiddishkeit, but they have their likes and dislikes, and they believe that Rabbonim etc. do no speak to them when they proclaim things that seem innocent to them to be Ossur and worse. They're the ones who knock Rabbonim and Roshei Yeshiva off all stripes whenever they can. Recent stories of coverups, corruption, and the general state of relations between Rabbonim, Rebbes, and Roshei Yeshiva only add fuel to the fire, and provide ammunition. Then there are those that are Oofgeklerte Mentshen, they may have had run-ins with Rabbonim and such for whatver reasons, and they don't care for them. Then there are those that simply don't see what the big deal about going to an innocent litle concert is, especially if there's separate seating and all, so instead of accepting the KK they begin to believe that maybe there's some truth to what the nay-sayers say about Kol Korehs such as these; that it's all a bunch of lies and bluff. I see that many agree that this all about breaking Lipa, and not so much about the actual concert. That Lipa is the first such threat to Heimishe/Chassidishe kids since he speaks their language, and teaches them to do stuff they never thought imagineable in theircurrent, pure Chassidishe state. "Di Moderne Kennen Gein Tzi Alle Rieches," they say, just leave our kids alone. That would explain why other concerts never get the attention that Lipa's get; since they don't really cater to the Heimish, so there's no need to bother. MBD, Fried and Shwekey, although they perform at all kinds of events and venues, aren't the threat that Lipa is even with his "no mixed seating" policy, which is why he taped his performances for HASC. This is apparently the motivation of those who went around collecting the signatures, not the Rabbonim, since the Rabbonim never saw it fit to Asser on their own. This too is another issue that begs to be discussed; why is it that "askonim," as well-meaning as they may be, are the ones that decide what the Tzav HaSho'oh is, and remind the Rabbonim what needs to be done?! Why is that the same Askonim who so fought the BP Eruv are the ones now saving us from this Issur? Are they as credible now as they were then? Are all those Yidden with Shtraymel/Vayse Zoken who carry their Taleisim and push baby carriages on Shabbos really racking up DeOrayses all that time like the "askonim" claim? What many want to see is the Rabbonim who signed go down there and stand at the entrance, warning people of the harm this concert will do to them and their children, and of the bad example that they're teaching their children. "If they're so concerened let them go down there and force people to defy them," they say, otherwise the KK is worthless. Obviously that'll never happen, as well it shouldn't. It's not LeFi Kvodom and and will only hurt their cause. Maybe the Askonim will get a group of guys to go and be Moyche instead, and maybe the cops will have to come and restore order; that oughtta be fun to watch, not that I'm a violent guy or wish violence c"v. They say that Lipa was at the wedding of a child of Rav David Abuchatzeira of Naharia, Israel last week, and that he got a major Brochoh for the concert, this adds another dimension to the whole saga; who's words have more clout both here and in Himmel, and why does the Tzaddik and Mekubal not see the danger that the Rabbonim here see. I would like to add that I think Lipa is a poster child of how people can use their G-d given talents and make good money from it, even frum people, and that G-d helps you if just go out there and apply yourself. I'm just not sure how this will end, and how he'll use his talents if his tapes and appearances will be banned too... Needless to say we haven't seen the last of this. An Interview with Reb Shabtai Slavaticki, HaRav Boruch Lesches, and HaRav Menachem Volpe, 3 Bochurim who left Yeshivas Kol Torah in Yerushalayim and went to learn in Lubavitch. Quite a read, especially if you happen to know any of them. Tzemach Atlas is the one who taught me all I know about blogging. Were it nor for him I'd never be doing that now. My intent may have been to counter him, but in the end all I did was learn. How to comment-mine and how to delete silly and irrelevant and hurtful comments; although I haven't deleted that much. How and when to post pictures, and how to make them pleasing to the human eye. I've realized now, after almost three years, that I never thanked him for ultimately being my blog Rebbe. I would've changed the URL for the blog were it not for the hassle it would be to inform evereybody of the new address. I wonder why he stopped doing what he did; was it because he figured he had done all that he can and that there was nothing to add? or did he get tired of it all? Tzemach has gone, but I imagine there may be others, copycats and wannabes who want a piece of the action, and will do anything at Lubavitch's expense. However, thanks are due, and that's the point here. I thank him. Let the record show that. It's been a long time since I've felt so passionately about an issue. I don't go to concerts, neither does my family. I've been to one in my life, The Helfg-tt concert in Lincoln Center. 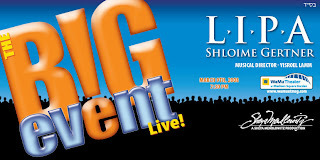 I don't plan on attending the Lipa Schmeltzer concert "The Big Event" at MSG next month, but I think what's happening here - the Issur issued by a variety of Rabbonim - is a terrible waste of time and money, and will ultimately come back to bite them where it counts. I don't think most of them know what goes on at these concerts and were probably fed a pack of lies by the so-called Askooonim, but that's beside the point. THE KOL KOREH WAS AN OLD, RECYCLED ONE FROM LAST YEAR, WHEN THEY WENT AFTER FRIED AND MBD IN ISRAEL!!! (read the line that begins הוא עצת היצר, and read the next line.) Lipa is fair game - he can attacked and banned - because he highlights what's so wrong with frum/charedi/Hungarian society; that you can walk the walk, talk the talk, and be so full of crap that you couldn't drag yourself five feet because of the heavy load you'd be shlepping along. That's why he speaks to so many young people today,, and that's why the Alte Zetzers hate him so. He's no different than a Yankel Miller, he just does his thing with a little more pizazz. What this Issur does for middle of the road people is tell them that all Rabbonim want to do is keep them from doing anything joyful. The concert is no different than The Ohel or HASC concert, it just doesn't have down syndrome kids singing like those do. The concert is separate seating, the Ohel and HASC are not. The concert is to benefit a Tzedokoh that "Oysshtuffiers" Chasanim and Kallohs in Eretz Yisroel, - Simchat Tzion - although it's not very prominent in the ads, they should've put it front and center. Most people I spoke to think that there's no Tzvek behind it, and it's only for the sake of Letzonus and Lipa's pocket. Nothing can be further from the truth. The only difference is that this concert doesn't have the fat cats who write the checks to Ohel and HASC making sure that nobody gets in their way. Are we that flimsy with our Yiddishkeit that a silly concert will destroy everything we taught our kids? The whole Puretz family (the ones that run Simchat Tzion) is a frum, fine Yeshivisher family of tremendous Chesed, and this is what they get in return, a hatchet job of monumental proportions. I know for a fact that nobody - none of the arrangers, organizers, performers etc. - were approached about the concert. They just went and put this together and are trying to destroy the man and the cause. I imagine tomorrow all hell will break loose. The organizers will walk to shul in the morning - or to the pre-davening Daf Shiur - and will have a full-fledged freak attack. First they'll approach some of the Rabbonim that supposedly signed and will demand to know why they did this without ever speaking to them and finding out what the concert is all about. The Rabbonim will probably say that they never signed the Kol Koreh, or signed under duress, and they won't be lying if they say that. Most of them were fed a great big pack of lies. What we have here is a full-blown case of Askonim out of control; people with zero Da'as, forget about Da'as Torah. These are people who don't fargin anybody any bit of enjoyment simply because they were never allowed to enjoy themselves. I say that because I know at least one of them, and his old man is a tough son-of-a-gun who would throw his own kids away if they stepped outta line, and I don't mean Chilul Shabbos. No good can come from people like this, and this not a case of good intentions either, their intentions are anything but good. The KK speaks to nobody. Most people that would listen to such Kol Korehs would never attend in the first place, Issur or no Issur. Those that wanna go will go anyway; they won't believe the KK or won't care. The only thing that may happen is that either the organizers will get cold feet and will back out, in which case the Tzedokoh loses and subsequently the Yesomim Chasanim and Kallohs. Or, the concert will go on B'Yeser S'eys, and the only ones with egg on their faces will be those that signed, whether or not they were under duress. And please; spare me the מאי אהני ליה רבנן speech, this is an attack against the Askonim, not the Rabbonim. When I mentioned this to a very well-rounded intelligent man, and that I thought this will only further alienate the already alienated youth of today, I was surprised at his response. He believes that the Charedi approach to preserving Yiddishkeit is basically "survival of the fittest." We need to do what we need to do, and if some fall by the waysides, if many fall away, if most fall away, none of that matters - as long as the few remain with which to rebuild. He seems to think that even while 70,80,90 percent of Jews were going off the derech that no attempt was made to bring them back or to keep them because the Rabbonim didn't care, and BeShittoh they didn't. As long as they had their small enclaves the rest could all go to Alle Ruchos. Today they invoke the same logic when it comes to senseless banning etc. All they want is that their small, little pristine enclaves stay pure and holy, untouched by alien influence. The fact that many of their own fall away doesn't really bother them (unless it's one of their own close relations, and then again, maybe not even then) as long as they have their little groups to continue with. The fact that those who till now would seek such forms of Kosher entertainment will now say "the heck with all that, it's all Treyf anyway" doesn't rally bother them. If they fall by the wayside it's all part of the plan anyway, so why bother to save them... What can I say? I need to start my day now so I'll sign off, but that's how I feel, Kol Koreh or not. VeIm Shogisi Hashem HaTov YeChaper Ba'adi. I fully appreciate the need to reign in spending when it comes to marrying off children, although I'm not in the Parshah yet. I also realize that with large families the burden is impossible for most families to carry. But this seems to be a bit overreaching. They delve into all details, even those that other people don't know about. When it comes to weddings, events that everybody is witness to, I can understand the need to curtail spending. But, what people spend privately - what they buy for the Chosson/Kallah - should not be anybody's business. At a recent dinner for Satmar (the Aron clan) institutions there was a debate between 2 askonim as to the question of whether or not to make these Takonos, and the "pro" side won. The result was a list that seems to do a lot of good, but isn't the real crux of the problem. To their credit they are trying, and the idea is to save heart attacks on the part of fathers later on, which makes everybody happy. But this is just too much, at least for me. Then again; I'm not a member there, i don't have the pressure to do all that in the first place. Not everything is how it seems. I recently had the good fortune to meet a whole new group of people and to spend considerable time with them. Once you get to know them, things you think you think you know from afar are not what they seem. Which reminds me of a story, Takeh from my days soon after Spinka, when at a family Simchah I met one of the Satmarer Bochurim I was once so uncomfortable being around. He asked me what I was up to, and the discussion soon got to Lubavitch. He was dismayed - to say the least - about my being interested in Lubavitch, and tried to "educate" me as to the terrible deeds that Lubavitch does. The one example that I remember is the fact that Lubavitch makes public Sedorim which causes people to be Mechalel Yom Tov. They also often make only one seder, which causes people to think that there's only day Yom Tov and Seder. Hence, Lubavitch is like Reform.... I chalk part of his idea up to the fact that he was still young then, and had no idea what he was saying; but also to the fact that he had a good ol' fashioned Williamsburg education. Anyway; years later I met him at a family Simchah, and boy, was I surprised how he had changed! It seems like he had since gotten married and gone abroad to a South American country to join a local Kolel. There this Williamsburger Yingel had seen Lubavitch in action and the whole communities they had set up from scratch. When he found out I was still interested in Lubavitch he let me know how impressed he was with Lubavitch and what a good choice I had made. Seven Years of seeing this had done a number on him, and although it didn't change his way of life (not that it necessarily needed to) it did change what he thought about others. The same can be said for a Lubavitcher who was visited by the Satmarer Bikur Cholim while languishing in a hospital; he too can see that if he hated Satmar for some reason there was reason no more for that. This can also be said regarding a non-Chossid who was the beneficiary of the kindness of a Lubavitcher somewhere while being stuck for Shabbos on the road to his favorite vacation spot. In short, once we meet those we thought were our adversaries we can see how alike we really are, and how we really CAN get along. More of the "I'm a Ben Teyre, Alles Kumt Mir" attitude that we merited in the "Achshir Dore" time we live in, brought to you by your friends at the Yated Ne'eman. 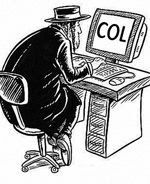 O' the Chassidic Inferiority Complex! Many of you may know about the Klausenburger Rebbe's recent trip to Eretz Yisroel to speak at the Siyum of the Shas Oz VeHodor. That event needs a post of its own, how the whole world of Rabbonim was coerced into showing up at nothing more than a business venture, but that's for another time. Once there he made the rounds and visited any Rov, Rebbe or Rosh Yeshiva that he could - besides for his own brother, of course, who was in America at the time, fanning the flames of the great split between the two here in America according to some. There was one visit that he made that bothered me in particular, the visit to Rav Elyashiv ZG"Z. Don't get me wrong, I have no problem with him visiting, it's just what went on there that really bothered me. Never have I seen a Chassidishe Rebbe who's so at home when others come to visit him lose himself when in the presence of a Litvisher Godol. It's as if he totally forgot that he's a Rebbe of hundreds of Chassidim, he was almost like a 9th grade Rebbe of a local Mesivta visiting. Put it in your favorites and check it daily. The Future of Chabad Chassidus? The venerable Mashpia Reb Itche Ofen farhering Bochurim in Chassidus Chabad. The Bochurim are part of a framework of Kolelim and Shiurim that teach Chassidus to Yungeleit and Bochurim from other Kreizen. Chassidus is a limud like Gemoroh Tosfos is, and the same attention is paid to itin Lubavitcher Yeshivos, including tests, shiurim, and Chavruses. Could this happen in America? I'm not sure. There seems to less of a demand for it here; people are quite content the way they are for the most part. In Eretz Yisroel it's happening more and more; Bochurim learning Chassidus (Chabad) in an organized and serious fashion, complete with Mashpi'im and Bechinos. There Bochurim feel free to explore other avenues, since they're away from home and without the pressures associated with being there. They can learn BiMokom SheLibom Chofetz, without worrying who's watching them and and who's looking where they're going. As someone who knows what it's like to have people hound you about where you're going, which Rebbe you're following and what you're learning I can sympathize with them, and have nothing but the greatest respect for them. I didn't have that difficult as some of them, so the admiration is even greater. In E Yisroel today there's a revolution going on. Hundreds and hundreds of Bochurim and Yungeleit are learning Chassidus in groups of all sizes, which is something that didn't happen years ago, even when there were large groups of Bochurim leaving their respective Yeshivos and going over to Lubavitch. Part of the reason is the man holding his chin, who was once the Bochur instead of the organizer. Why that is I cannot say, but part of it is due to the fact that many that have drunk from the wells of Chassidus have shared what they have with their counterparts. They're the ones who went out and told their friends "Taamu U'R'oo Ki Tov, Farzoocht Vet Ihr Zehn az der Aybershter iz Gut!" Chassidus Iz Elokus, and everybody Chassidishe Bochur and Bochur Bichlal should also taste those waters. Among the Dati LeUmi and CharDa"lim the revolution is even greater; with nothing holding them back in the first place, and the inherent pull to the spiritual that many have going back to the early days of "Merkaz HaRav", the ground is quite fertile there. Farbrengens with marquee Mashpi'im happen quite regularly and entire Hesder Yeshivos are brought to Tomchei Tmimim to enjoy a Shabbos or Yoma DePagroh there. Chassidishe and Litvishe Yeshiva Bochurim have a little more of a difficult time with their Yeshivos, but they manage. After all, if Bochurim can sneak out to have a good time, why not to learn a shiur in Chassidus? As far as them being the "future" of Chabad goes; I didn't mean the only future, but rather a significant part of the future. Every group enjoys variety, as long as they play by the rules. That's where radical Meshichisten go wrong, they make up their own rules. Throughout the years Chabad has enjoyed the influx of outsiders or the most part, and this may be no exception. However, now is not the 5720's, things are not how they once were. Then they came in droves, it was easy. Today a Bochur or Yungerman needs to have a very large dose of intestinal fortitude to make the change these days, with all that's going on, and no visible Rebbe either. Some do, even today, but many stand by the sidelines, adapting most of Toras & Minhogei Chabad to their lives, but maintaining their outward appearance and customs, especially those that come from Chassidishe families. They're Mekushar to Mashpi'im like Reb Itche Ofen, Reb Zalmen Gopin and Reb Chayim Sholem Deitsch and the Rebbe is their Rebbe, as are the previous Rabbeyim, but they can't take that last step. Those that do make the quantum leap have much to bring to the table. Often times the response to criticism of Chabad by Rabbinic individuals will be "If their son or daughter goes off the derech who they gonna call?" That may be somewhat of a stretch, since we can't all sit back and wait for somebody's kid to frei out r"l. It also brings in the whole "ends justify the means" ideal, not something we subscribe to. You also cannot judge people in times of distress, so the fact that they turn to Chabad in times of need means little to me, Keyodua the story with Rav Aron Kotler and the mob. I say that as a Lubavitcher; the fact that people use Chabad when it's convenient for them is proof more of peoples' weakness of character than what they believe or don't believe in. So, the fact that he looks to a Lubavitcher for help with his child means not so much to me; he just doesn't have the guts not to, he wants his child back. The pictures that I link to are of a Seudas Yohrtzeit in Istanbul, Turkey at the home of the Lubavitcher Shliach there, who happens to be a friend of mine - not that it matters. It sems like recently the Tziyun of the Baal Smichas Chachomim has become a hotspot for grave-hoppers, and there's a substantial Aliyah LeKever on or around his Yohrtzeit. Some of the usuals include Reb Itcher Meir Morgenstern, a Breslover/Mekubel from Yerushalayim, Rav Yekutiel Abuchatzera, and others. This year the Rachmistrivker Rebbe of Yerushalayim also was there. Of course, where would Rabbonim and Tzaddikim eat the Seudah and rest up from their journey? Do they go to the local Aish or Or Someach branch, noooo. They go to our friend the shliach, and they gives them all the comforts of home, including bulkes, and gefilte fish, so that they can have the seudah mit alle pitchevkes. It comes as no surprise that people like the Rachmistrivker and Reb Itche Meir stay there; they're not vocal opponents of what Chabad does, and have no qualms about staying there, but there is one fellow at the table that surprised me somewhat; Rav Moshe Shapira. Readers of Gil Students's Blog may know him from proclamations he made in Rav Elyashiv's name about Rabbonim who subscribe to Slifkin etc. BeNoge'ah creation and the age of the world; namely that those who do believe in evolution or that the world is more than 5768 years old are heretics and should be removed from their posts. He's somewhat of a Reb Don Segal, and is traveling to the FSU in the near future with him to lead the VLNY's annual PR trip to the FSU. Needless to say he's no fan of Chabad. He was there for another reason, a noble one actually, to view the destruction of the ancient Jewish cemetery, something that was made possible by the local Jewish community, by them selling the land to local developers ana allowing them to do with the land as they wish. In any event, I hope that Rav Shapira will go back to Eretz Yisroel and tell his friends and colleagues about the good work Chabad does, and maybe in the FSU he'll make a detour and see what they do there too. He sees it as a his fault that he needed to stand up for Torah and Kedushah. If only he'd cut the Lubavitch nonsense he'd never had such problems in the first place... It seems like the event happened at a public Menorah lighting, and that, I guess, is total nonsense according to them, it never accomplished anything, and is just there to make Jews feel good about themselves. Additionally, it adds in Anti-Semitism, as we see Goyim gnashing their teeth whenever they see a Public Menorah. Their methods are rock-solid and a mere one hour "seminar" can and does make "thousands and thousands" of complete Baalei Tshuvah, not just jelly doughnut fressers.... Of course, if the snag would have the problem while running a Mosad, then he'd find his way around the problem, if you get my drift. This Shliach has seen enough! He Responds to This Bash-Fest on Cross-Currents, and gives it directly to Toby Katz. This issue has been debated ad nauseum even in this forum, I doubt anything I will add will change anyone's set mind. It seems every Lubavitcher, Moshichist or not, is painted with the same vile brush, the fact that within Chabad there is extreme anger and even purging (witness the recent court case against the M’s in 770) is meaningless. The fact that any reader here can walk into a Chabad House throughout the USA, and in 99% of the cases will find not one hint of Yechi, Moshiach etc. is meaningless, The fact that at the recent Kinus, attended by over 3,500 Rabbis and 1,500 lay leaders and not one hint of Moshiach was uttered, is meaningless to this august crowd of contributors who continue to fill this and other prominent Blogs with their venom nothing else matters. How many times have I read, of writers who while grudgingly admit that the Rebbe was “a Talmid Chacham” never even saw one of his, over a hundred, published works in all parts of Torah, Kabbala, Halacha, etc. yet heard from someone that heard from someone that he knew a little how to learn. How many times have I read of writers who dismiss Chabad work and wax knowingly about the type of Rabbis and communities they establish, and what they do there without even once visiting a Chabad House, or even meeting a Shliach. 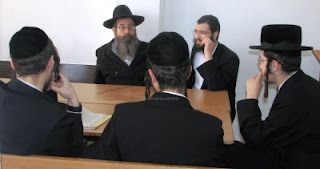 They rely on hearsay, on fragmented stories, on admittedly true stories but of disturbed individuals who perhaps never even learned in a Yeshiva but has decided to don a Kapote and wear a Borsalino and a beard. In a recent Blog, I read a comment by one who heard that someone visited someone, not a Rabbi, and before he made Kiddush Friday Night he kept looking at the Rebbe's Picture. Shoin!! Chabad is Ovdei Avoda Zoro. This is so ridiculous, laughable even, had it not reached such harmful proportions. How many readers, before they solemnly write out a segment of Klal Yisrael, a huge group of dedicated, good hearted, knowledgeable, nice families, who’ve dedicated their lives, in sometimes extreme conditions, to helping lost souls of Klal Yisrael, even bothered to drive thirty minutes, and spend a Shabbos at a random Chabad center, or two or three and see for themselves what really goes on. I came to Sherman Oaks, California 21 years ago, there was nothing anywhere near my area, I was the only Frum Jew within 5 miles. I put up signs and some Yidden walked in. We have had a kosher minyan ever since. I gave a shiur in Chumash Rashi before davening, a Dvar Torah before Mussaf, and a shiur at mincha. I gave a tuesday night shiur, and my wife gave a monday night womens' shiur. We started an afternoon and Sunday Talmud Torah, ultimately sending dozens of students to the local orthodox day school, which in turn cemented the parents and the whole family to stricter Torah observance. We built a new building with a Mikve, the only Mikve in the immediate area for women, and the only mens' Mikve in the entire East Valley open daily. We now have over 120 people coming each Shabbos to Daven, we have a minyan 3 time daily with shiurim every morning and evening before mincha. On Yomim Noroim we have 2 minyonim, Ashkenaz and Sefard, with an aggregate of close to 800 attendees, no membership. On Monday nights there is a Shiur Torah in Russian, on Thursday nights in Hebrew, and Tuesday nights in English in addition to lunch and learn. We have a Talmud Torah with over 60 children, and a Bat Mitzvah club every year of Bat Mitzvah girls, we have a womens shiur and monthly tehillim groups , and we constantly have speakers on relevant Torah topics. Oh, and Boruch Hashem, we are an established stop for many meshulochim, collecting for decidedly non-chabad institutions daily. Of course they don’t seem to have any problem soliciting our funds, I guess Money is not Metame.. The past president of the local elementary school, the largest in the west, walked in to our shul years ago, now he, a full Ba'al Teshuva, and others on that same board as well who are mispallelim at other local Chabad institutions, give back tremendously to the community at large. There's more, but I won't bore you. Just in The Valley there are 21 such Chabad houses and centers. Some more succesful (Agoura Ca., Encino, Tarzana)) some less. Does anybody reading this realize any of this before they so willy-nilly tar and feather Chabad off the Jewish map? And yes, we talk about our Rebbe, we teach and learn his Torah, and we inspire people to follow his example of leading a selfless life of Torah and Mitzvos. We are Chassidim, we are connected to a Rebbe, we are proud of that. Were it not for the Rebbe's inspiration, I would have simply joined my families’ business and sat on Blogs all day. And no, we're not perfect not even close, we in Chabad, as in every single group, have their bad rotten apples, doesn't everybody? I do, however, want to express my extreme disgust at “Rebbetzin” Katz, and her vile remarks in this forum and others; ugly, snide words cloaked in backhanded praise wondering whether the poison in every drop of water justifies the good. Afra Lepuma, I take personal offense. I am the Rov of a Chabad Shul, I receive no compensation, I have a business. I receive tens of Shaalos a week from Jews of all Valley communities, as it seems that I am the only one available, and I have merited to good Shimush. I am asked to adjudicate disputes, I have shiurim for hours daily, I have Kashered kitchens and put up mezuzos, I have brought unfortunate people to Kever Yisrael and attended more Shiva calls than you can even imagine there being. 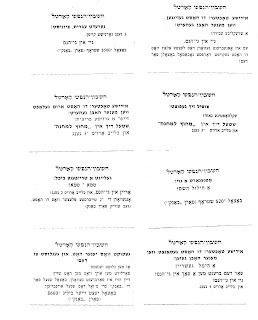 I have visited children and siblings of frum tradiitional homes who have landed in prison, I have made loans and donations to all types of Jews knowing I will never get it back, I have interceded on behalf of single mothers and other unfortunates to all types of schools, camps and institutions for free or reduced admittance and you dare to accuse me and my dear wife and children of instilling poison??? who are you, and how dare you even think words like that, let alone write such spiritually murderous poisonous words? how does a Jewish daughter even say such things? your Father was a Gerrer Chosid, does that make you an authority on Chassidus? you should be ashamed of yourself! what kind of warped chinuch did you recieve? I do not ask you or anyone on this forum to become a Lubavitcher Chossid, nor do I care what you think, nor do I even delude myself that there is not very valid criticisms of many in Chabad, nor would it bother me if anyone were to ask questions about my Rebbe's opinions and teachings, but to write words like that? on what basis? you met a few nut cases or misguided lunatics and you judge a whole Eidah? would you judge other communities similarly? I, and multitudes of my colleagues, who BTW, bear the brunt of the justified backlash of the group of Meshichisten around, tend to flocks of Yidden, teach them Torah, introduce them to HKB"H and his Mitzvos, in many cases seeing them continue on their journey in another more established community. You should all be ashamed of yourselves, the shmutz I read in this blog and others, is shameful. Learn a little about Chabad and its Rebbes, open up a Sefer of The Rebbe in its source, not what some former student or dropout or single person interprets his words. Realize that as with any discipline, especially mystical, one has to understand the context and vocabulary used. Visit a Chabad House or two, and look at the type of Far Far off Jews on the front line these Rabbis have to deal with in way off communities and see what they have to work with. See how they live financially, see what it takes to educate their children properly, the hours and expense incurred to do car pool to the city etc. the mesirus for life in a foreign environment then try to emulate them and do something positive. I know I went too long. But enough is enough! you cannot continue to murder an entire Eidah Kedosha on lies. 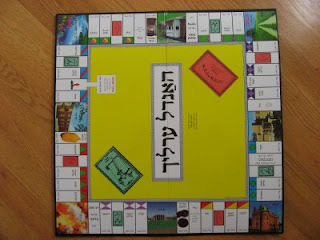 Some of you may have seen this Yiddish game mentioned on Blog In DM, and also elsewhere. Most of the hullabaloo was about the fact that the game is a rip-off of Monopoly, and that the Yiddish is very cute to see on a board game. Some also mentioned the approach to teaching kids Torah values, namely to make them feel like worthless pieces of garbage for very small infractions. OK, maybe that's a bit of a stretch, but you get my drift. Then again; that was always the way things were done in those circles, so it really shouldn't surprise me. I guess if that's the way you're going to raise children start early and make it educational and fun... Infractions like laughing on the street or ven Mener Hubben GeHert, Reden English Tzvishen Zich, or Geholfen Di Tziyunistishe Medinah are way up on top of the list of Aveiros Chamuros and send you straight to Gehenom! To be fair, infractions such as "OopGenart a Goy" are also listed there, not so much for the Etzem Zach, but more so for the Chilul Hashem that may come out. Sort of like the Chilul Lubavitch reason some things are done in Chabad; basically "Ma Yomru HaBriyos." There are many ways to raise children - Yiddishe children - and this is a manner that is still used by many today; Myself included sometimes. What can I say? Old habits die hard, and it takes many years of hard work to knock that out of your head. My cheder education was not as extreme, but still along those lines. Part of keeping old traditions is maintaining their methods, and never deviating from even the worst of practices, be they Melamdim beating kids for minor distractions during class or berating them for being children. The fact that they used this method in Williamsburg should surprise nobody, it's no different than maintaining dress codes or other Takonos, and just like they're kept to so too are the education methods. Whole books are published, and major meetings are called for in Willy when a cheder changes things like saying Kometz Aleph OOH and begins to teach the kids "OOH BOOH GOOH" instead, (If you don't get what I'm saying skip it.) so you can imagine what happens when they're told that the way they've been educating thousands of kids is wrong or needs to be changed. I just wish they'd see that educating with threats and Petsh and the whole "Gei MiChutz LaMachne!" approach is detrimental to everything they're trying to do, which is raise nice, good Yiddishe Kinder. But hey, it's their lives, right? Then there's the issue of the musician author of the Blog in Dm being paranoid and believing those silly stories he heard as a kid. Here's what he says: This is a board game called "Handel Ehrlekh". It's hard to translate the title accurately. Idiomatically, it means "Dealing Ethically", but "handel" often has somewhat of a negative connotation as well, as in financial wheeling and dealing, or "bargaining down". Mr. DM, you need to stop believing that nonsense, it's not very becoming of an educated member of the musical elite to believe hearsay like that. Yes, you may ocassionally hear stories from that neck of the woods that conjure up images of unscrupulous Jews taking advantage of the less fortunate, but Ad K'dei Kach? to think that they LeKatchilloh educate their kids to bargain and be dishonest? That's a stretch, don't you think? the good people of Williamsburg deserve to be judged better by yourself. Besides, it was one guy who made the game, not an official production. Treyf! Wow! you are projecting the new Bnai Towra -Yated Neeman -Maran- Degel HaTore ideology upon the Agudas HoRabbonim and American Yeshivas of the the 1945-1980 period. That is the "problem" with youth . They think the world never changed and started when they began to read and understand. thus, to the youth Chabad was always like today, the Yeshiva world was always the same, the Conservative movement never changed. Hob nit kin Faribel, but this shows a total lack of perspective on history and events. Rav Moshe was the Rav's first cousin and the Agudas HoRabbonim, whose president he was, stood in awe of the Rav. Bnai Tore from all American Yeshivoth went to the Rav's public shiurim that includes people from MTJ, RSA, Tore VeDaas, RCB, RJJ etc. Of course there were Chilukey Deioth between the Rav and some other Roshe Yeshivas, but please remember the world did not start in 1987 with Degel and Maran. In the 1960's American Bnai Tore went to college, were clean shaven, played basketball, wore straw hats and went out on dates. And the rabbinical world was marked by people like Rabbis Teitz, Rabbi Lazer Silver, Reb Moshe, Rabbi Sheinkopf of Springfield, Rabbi Tobias Geffen of Atlanta and other Litvishe Rabbonim many of whom were Mizrachi and others were very left wing Aguda "legabe" Zionism. The same openess that led Reb Moshe to step inside 770, permitted him to be Machshiv the Rav . Yes, in all honesty there may have been a few kanoim then in DA Mir and Beth Hatalmud and Telz, but believe me, the Gedole America like Rav Silver, Rav Henkin, Rav Moshe held very much of the Rav. Even Rabbi Dovid Cohen who made a Macho'eh in one of the Rav's Droshes (Hesped on Rav Velvele of Brisk) actually went to this Drosheh and received no support from the other audience members. In circa 1945-1980 there was no Yeshiva community in the USA. There were yechidim who considered themselves learners, and perhaps at most 150 yungeleit in Lakewood, 150 !!!! There were no Bnai Towra and no Chayolei Bais Dovid either, if you get my drift. Treyf, man dikar shmay !!!! Tzig, You just don't get it . 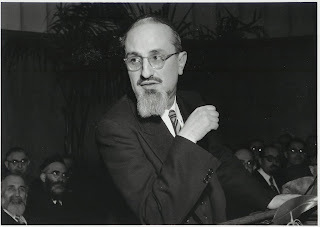 There was no Bnai Tore community in the US until the late 1960's for Rav Aaron to lead. When he died there were at most 150 yungeleit in Lakewood. Perhaps half that amount in Monsey and VeSu lo. The Yeshiva Basketball league consisting of Chaim Berlin, Tore VeDa'as. MTA, Flatbush, and HILI etc. played in a league that included at least 1 team with females - yes live girls - acting as cheerleaders ! Zeire Aguda Israel sponsored "mixed" activities. Exactly what "Bnai Tore" are you speaking of, the ones who went to College at night, or is the ones who dated real live girls ? Who ever heard of shadchanim in the non Chasidic world until the 1970's. Do you mean the yeshiva boys from RJJ or MTJ spending summer in the Rockaways on the beach ? 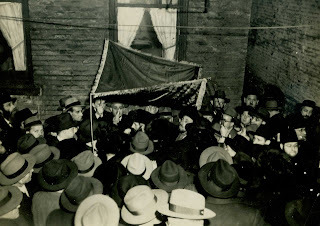 The Olam Hatore in those days was the Agudas HoRabbonim, the hundreds of Litvishe Rabbonim, Shochetim, and talmide chachomim across the US, and Tzig, they all stood in awe of the Rav. These community was led by Rav Henkin, Rav Moshe and the Rav. Do you realize that until the early 1970s the premier gathering of Orthodox Jews and Rabbonim was the annual Mizrachi convention in Atlantic City not the Aguda convention which was attended by a few clean-shaven Gerer and Tore VeDaas chevra? Tzig, who was the guest speaker (keynote) every year at this convention? yes, the Rav. By the way reading his "Finf Droshes" would be very worthwhile for all your readers. These were all delivered at Atlantic City at the Mizrachi convention. 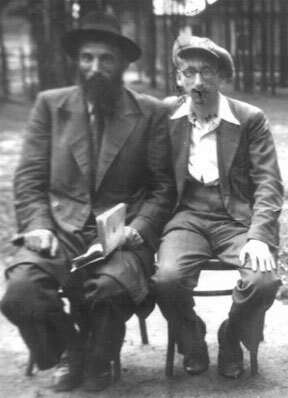 By the way I am certain kevodo has seen the famous picture of Reb Aaron sitting NEXT TO THE RAV at the Chinuch Atzmoi dinner. Since you are good at fishing out pictures put out the bait, and I challenge you to print this one too !!! Finding quality material to post is no easy task, sometimes it takes some time. Rest assured that I'm hard at work trying to put out the posts you want to see, without getting under your skin. If you find that hard to believe then this picture will prove it. Israeli Radio spends a day in Kfar Chabad 40 years ago. They say that Chaim Yavin - one of the broadcasters there - was a great grandson of Rav Shlomo Kluger zt"l. Nu, Nu. The Ameratzis of these broadcasters is surprising; not knowing the difference between a Gemoroh and a Sefer Chassidus, and thinking that a Shas is a set of Mishnayos. Then again, they could've been second or third generation frei already. 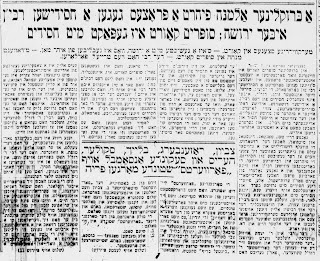 The story that appeared in the Yiddish Forverts in December 1932 tells of a widow who took a Chassidishe Rebbe to court in Brooklyn, and the spectacle that took place during the trial, complete with a Jewish judge and lawyers talking in Yiddish, a court translator, and a break for Minchah where they all davened together! How do I know it appeared in 1932 if there's no date on the paper? simple. The story tells of 11-year old Duvid'l Twersky, the Rebbe's son, who was also part of the process here. Duvid'l was later known as the Boro Parker Skverrer Rebbe, and was born in 1922/5682, so I did the math. (I later was told the exact date of this article by a friend who found it in the English Forward as a "75 years ago in the Forverts piece.) At that trial the Rebbe was forced to testify - in Yiddish - and tell the jury - comprised mostly of non-Jews - what a Rebbe is about, and what Kabboloh and Nissim are too. How did all this come about? The same way all trials come about; Money. This widow and the Rebbe and his family both wanted the money of a certain Yid, and only the court system could decide who should get it. The Rebbe here was Reb Yitzekel Skverrer who passed away in New York in 5701/1941. His father was Reb Mordche Skverrer, a brother to Reb Yankev Yosef of New Square. IIRC when RYY came to America after the war he asked permission of his nephew's children (!) if he could use the name Skver, since they were already known as Skverrer Rebbes... RYY had another brother in America, Reb Menachem Noochem who was married to the sister of the Machnivker Rebbe who later came to Eretz Yisroel, but he passed away in 5706 before RYY arrived at these shores. So Reb Itzikel Skverrer in Williamsburg had a Chossid who came to America before WWI, and who had been a Chossid of Reb Itzikel's Zeide, Reb Doovid'l Skverrer, son of Reb Itzikel, son of Reb Mottele Tchernobler zt"l. By Chossid we don't mean a Chossid like Reb Hillel Paritcher or the Radatz, but a simple Baal Agoleh who once had the merit of taking Reb Doovid'l on a trip in his wagon and had witnessed a Mayfes. Since then he was hooked, and when he heard that Reb Doovid' had an Aynikel in America he became his Chossid too. 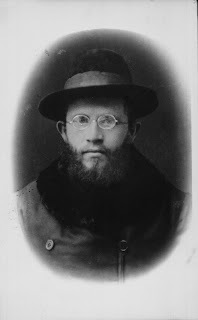 This Yid - Reb Shmuel Runyen - had come to America in 1914 from a small town in Kiev Gubernye, leaving behind a wife and 5 children. His plan was - like many others then- to make enough money to eventually bring them over too. Unfortunately WWI soon broke out soon to be followed by revolution and pogroms in Ukraine, so his plans were pushed back a few years, which means he was here by himself while his wife struggled with the family back home. Needless to say distance did NOT make the heart grow fonder here... Shmuel did eventually bring his family to America in 1921, but there was lots of mistrust and bad feelings between the the wife and kids and Shmuel, and he wasn't happy with his wife and daughters, which eventually lead to Shmuel leaving his wife and kids and moving in to the Rebbe's house! For 8 years (!) he lived in the Skverrer Rebbe's house and ate at his table, until one day he was hit by a truck and commited to an insane asylum. 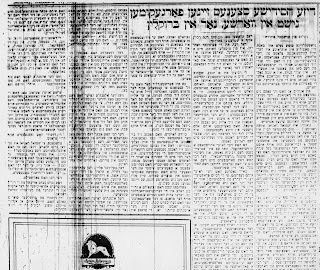 The Rebbe solicited the help of a Williamsburg doctor - himself a Skverrer Chossid - and Shmuel was released from the asylum, although according to the paper he never fully recovered from the accident. He died four years later, but not before he wrote his life's savings - Thirty-Six Hundred Dollars - over to young Duvid'l Twersky, to the dismay of his wife and children who seemingly sued the Skverrer Rebbe. After a trial of three days the jury ruled on day 4 that the money is to kept by his family, but not before the spectacle that took place in front of large crowds. The woman was of the opinion that the Rebbe had him in some kind of spell that made him give over his money. From the article I didn't see who sued whom, but it may be that the Rebbe sued the widow that she turn over the bankbook. That would be strange, to say the least... Questions were raised as to his level of religious observance, and whether or not one is allowed to disembark from a docked ship on Shabbos. The judge too had to be a Boki in Hilchos Shabbos. I could be here all night recounting what took place but I'll leave that for next time. What did get me was the fact that according to the newspaper his funeral was attended by his wife and kids. That's it. The Skverrer Rebbe, or his shul members/Chassidim didn't. Strange. After all, the man had just made a gift of $3600 dollars, so you'd think that the least they could do is pull together a Minyan to say Kaddish on his Frishe Kever. It may not have been for the reasons we were told. According to Michtovim Blog it may have had more to do with infighting, Mesirah, and no-good students than just the refusal to learn any Limudei Chol. It never did make sense to me; after all, if Telshe in Lithuania LeKatchilleh had Limudei Chol why would Volozhin close down just because they were FORCED by the Czar to implement it?! Today many in Eretz Yisroel use Volozhin as proof that any and all Chol in Yeshivos is Treyf. That it's better not to learn than to learn Chol as well as Kodesh. Rav Steinman discusses the 2 different approaches to the learning of Mussar.